My oldest son needed a Kings cake for spanish class. It seems he go the baby Jesus during the Epiphany celebration in January. Of course he reminds me after dinner last night so he and I head out to find a Publix who has still has one in stock. Lucky for me ... actually him ... I found plenty of them in stock at our first stop! I had to do some researching last night to learn all about the Kings cake. It was not a tradition in my house to have one even though I grew up in a Catholic ... no meat on Fridays or Wednesdays during lent home. Not to say that Kings cake is Catholic ... but you get where I am going with this. After doing some research I learned that the baby Jesus is supposed to be baked in the cake not given to you in a plastic bag in the box. Insert panic as how I was to get the sitting up baby Jesus in the flat Kings cake without everyone knowing where he was!!! Lawyer stepped in ... performed a little surgery and even he couldn't tell where it was when all was said and done. So as I was headed up to bed I decided to sample the extra cake we bought for us at home. Holy slice of crack!!! That stuff is sweet and pretty much amazing!!!! It is so packed with cinnamon, pecans, sugar, icing and more sugar I was up way past midnight and all of my besties know I go to bed no later then 10! I had another smaller slice this morning with my coffee and thank goodness that bit of Satan is almost gone! Happy Fat Tuesday to all! If you see me running around like my hair is on fire you will know I polished off the very last piece of the crack cake! 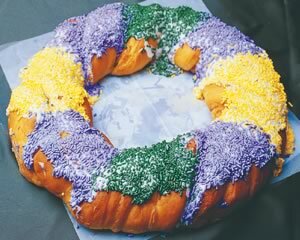 I have been craving a Kings Cake all day! I need a little "pick me up."